Isaiah 30 is a passage that details the obstinacy in sin of the Israelites – how they, as a nation, insisted on turning their backs on God and how woe will come down upon them, as a nation. Yet as most prophets are so adept in, in the midst of all the prophecies of destruction and judgement, there comes prophecies and promises of God’s grace and forgiveness. This verse served to assure the Israelites of God’s promises and that he will always be with them. In this study, we will be examining the promise that God will be with us through our trials and our dilemmas. Whether you turn to the right or to the left – have you ever been in a position where you turn to the right or to the left and you do not recognize anything or anybody, and you do not know where to go? Physically, emotionally, spiritually? Often we are like the Israelites in Isaiah 30:11 – Leave this way, get off this path, and stop confronting us with the Holy One of Israel! We stumble when we are faced with this question: my way, your way, or God’s way? Yet we do not answer this question verbally. We answer it, whether consciously or not, through our actions. We go on some other way, and when somebody chases after us and ask us to turn back, we shout for them to leave this way, get off this path, and stop confronting us with the Holy One of Israel. We often face with crossroads in life. Sometimes we’ve already embarked on the wrong path. Sometimes we are afraid to get choose a path, for fear that it would be wrong. In times like these, let us find comfort in the Lord and his promises. This is the way; walk in it – Today we may seek and find, but we can’t seem to figure out which is God’s way. Today when we face an important decision in life, we may pray and pray but we cannot seem to put a finger onto which option we should take. We have our doubts, and like Gideon, we want clear signs from God. 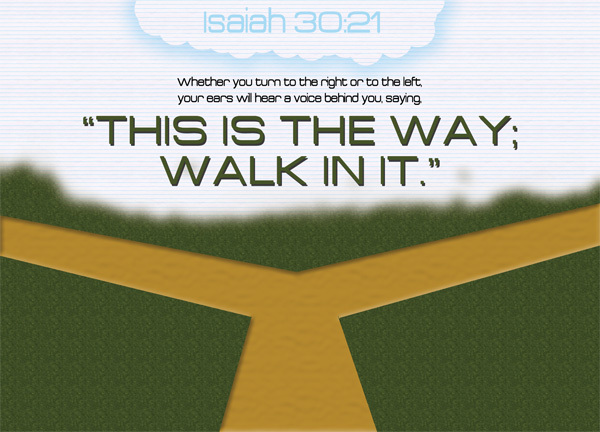 We would love to have God speaking behind us and telling us which is his way whenever we face a fork in the path. Perhaps we have been given signs, but we do not recognise them. Perhaps at times, it doesn’t matter which route we take, because they will end up at the same destination, with similar obstacles and blessings. Sometimes the decisions that we can make aren’t all black and white – our forks in life aren’t always choices between evil and good, choices between sabotaging and aiding; choices between sinning and serving. When we are helpless and lost, there is no cause to worry, for God is there even if we cannot see him or hear him, and his voice will come through to us one way or another – often in ways we cannot expect. When we see a fork in the road and do not know which way to go, let us trust in the Lord. When we keep our heads down and our feet rooted to the ground, know that God will keep us in the right path, even if tempters try to coax us onto the left-side road or onto the right-side way. And when we have erred and walked the wrong way, let us return to the Lord and trust that he will open a way out for us. God will be with us – not that we will never face trials, but that he will be with us even through our trials and our dilemmas. Our pastor asked us to prayerfully compose a list of spiritual goals this year, and every time I prayed, this was the key verse God brought to mind. It’s my “goal” for the year to listen more – a lofty goal, but surprisingly, not a hard one! God bless! I came across this website as this verse was my daily verse today 20.8.15. I’m also at a crossroads in my life in various areas. I guess this was an example of being led by the Spirit – having reached here. Confirmation from God to continue intuitively as I’m on the right path. Thank you so much for writing this article. God bless you.